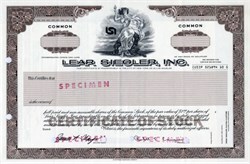 Beautiful specimen certificate from Lear Siegler, Inc.. This historic document was printed by the Jefferies Banknote Company and has an ornate border around it with a vignette of an allegorical woman holding a torch. This item has the printed signatures of the Company’s President, and Secretary. Lear Siegler Incorporated was created as a result of a merger between the Siegler Corporation (Los Angeles) and Lear Avionics Inc. (Santa Monica) that was concluded in 1961. John G. Brooks was the founder; President and Chairman of Siegler and William Lear was the founder; President and Chairman at Lear. The merger was based on Brooks' goal of growing Siegler into one of the first conglomerates (with a focus on aerospace markets) and Lear’s goal of divesting his ownership interest in Lear to pursue development of his Learjet corporate aircraft (the first pure jet private aircraft). The resulting firm, Lear Siegler Incorporated,[which?] leveraged its new expertise in controls, instruments and navigation systems into a steadily increasing share of government and general aviation contracts for research and development, as well as system delivery. Notable innovations include inertial guidance systems, "hands off" landing systems, the telemetry and navigational instrumentation for the Apollo Moon missions, and the flight controls for the Lockheed L-1011 commercial aircraft. In its expansion, Lear Siegler had acquired Bangor Punta, which was an early conglomerate manufacturing Piper Aircraft, multiple brands of sailboats, Smith and Wesson firearms and other well-known brands. In 1985, a group led by Forstmann Little & Company, the New York investment firm, agreed to acquire Lear Siegler Inc., the aerospace, automotive and manufacturing concern, for about $2.1 billion in cash, the acquirer said today. Lear Siegler stockholders will get $92 for each common share and $230 for each share of preferred, for a total of about $1.7 billion. The balance is to go for refinancing debt and other costs. The company, based in Santa Monica, Calif., will become privately held, owned by Forstmann Little and Lear Siegler management.